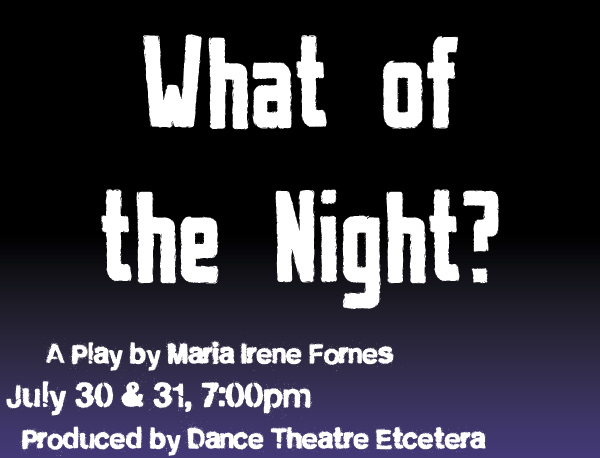 For the last month, I’ve been working with an incredible group of students/artists/friends on staging Maria Irene Fornes’s play, What of the Night? Now all our work & passion will be funneled into two performances this weekend. Friday & Saturday, 7pm, at the Cornell Paper & Box Company loading dock . It’s right behind Valentino Park & Pier, actually in the same exact place we put the stage for the Red Hook Fest, for those of you who’ve been to it in the last three (four?) years. What of the Night? is a beautiful play, and the cast is wonderful. Plus it’s a unique place to see some theater, with the sun setting right over your shoulder as you sit less than fifty yards from the water. Come on out to support some emerging artists, Red Hook-style. BWAC’s newest exhibition, “Red Hooked,” begins tomorrow. It’s a beautiful space & they pack so much artwork in there there’s sure to be something to make you think/feel/BE. …here’s a look at five pieces in the show and how they fit into the show, courtesy of BWAC’s Carmel Dudley. Smith photographs the crumbling, dirty, toxic streets of Brooklyn with the people and animals that live within the grit. To her, to be “Red Hooked” is to examine the life that keeps growing through the cracks in an industrial landscape. Rotting buildings being taken over by plant life, kittens living in abandoned buses, and, of course, the people in the midst of it all. 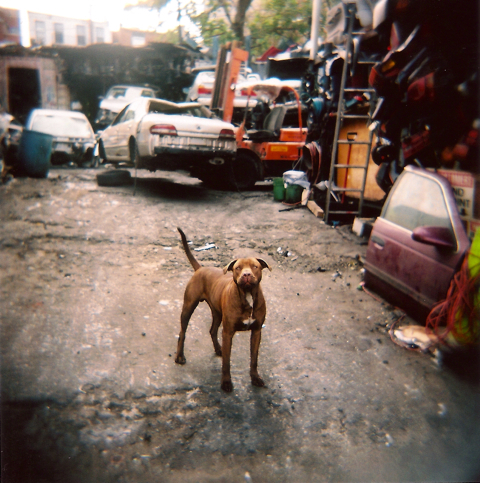 In “Untitled,” a muscled dog stares steadily from his home in a Brooklyn junkyard. OK, it’s only been two weeks since the last post, but it seems like a long time. Dance Theatre Etcetera and Green-Wood Cemetery were honored for their collaboration on the production of “Angels and Accordions,” a site-specific, live music and dance performance that uses the cemetery’s rolling hills and unparalleled collection of sculptures and monuments as its backdrop. For the past six years this free performance event has become an annual ritual, drawing thousands of New Yorkers to one of the city’s great landmarks. If you’ve never seen Angels, check out some clips online (not that it does the show justice). Stay tuned for more Angels news this fall. Set up and seating begins at 8 p.m. The movies start at around 8:30 p.m. Gourmet popcorn from Home/Made will be available for $1 per bag. Other area restaurants will be offering pre-order specials for moviegoers. I have to admit, tonight’s movie- The Goonies– never had the same pull on me as it seems to have had on every other child of the 80’s. Haven’t seen it in a while, though, and it’s certainly a great place to see a movie. They’ve even got an awesome backup location in case it rains.